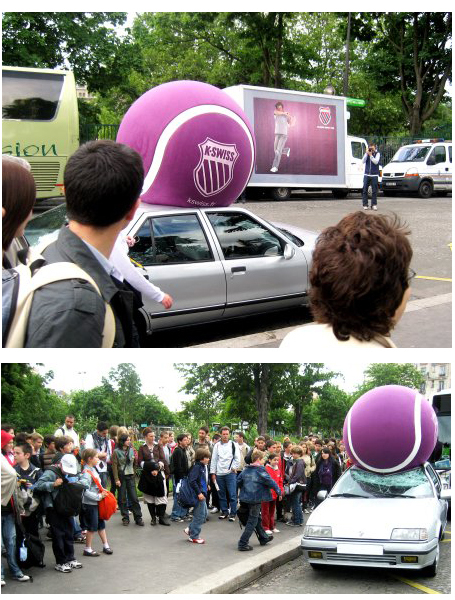 During Roland Garros French Open 2008 K-Swiss made a big splash with guerrilla marketing campaign involving a giant purple tennis ball. Placing the installation outside a major subway exit, it features a 1.5 m (approximately 5 ft) tennis ball crushing a car with a swinging tennis player on a poster in the background. The ultimate goal was to create a 3D reference between poster and the real world which definitely attracted a large crowd and strong reactions.